It’s easy to get swept up in the hype surrounding Gravity. Alfonso Cuarón’s latest effort is truly a technical marvel, and it is one of the most visually stunning films to come out in years. This is the type of feature that begs to be experienced on the biggest screen possible — IMAX 3D, preferably — and it’s the rare release that is garnering nearly unanimous praise from critics and audiences alike. Taken on these merits alone, Gravity is worth the trip to the theater. However, it is lacking in a few crucial areas, and these issues keep it from reaching the “instant classic” status that many are quick to label it as. In theory, the idea behind the film is simple. 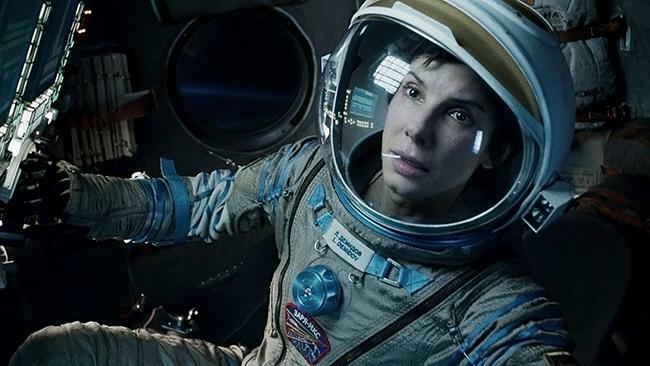 Dr. Ryan Stone (Sandra Bullock), a rookie on her first space mission, and veteran astronaut Ray Kowalski (George Clooney), on his last mission before retirement, are performing a routine spacewalk before disaster strikes. A Russian missile strike has caused a massive chain reaction, sending seemingly endless amounts of space debris heading directly toward them. Their shuttle is destroyed, and soon the two protagonists become split apart. At this point, our attention is focused primarily on Ryan and her will to survive. She is given a slight bit of back story involving a tragedy that occurred back home, and this is used as an attempt to get us to connect with her. In reality, this little nugget of information feels contrived. Ryan’s story is something that has been done to death in cinema — can this emotionally broken character overcome the overwhelming odds to stay alive? — and the overall writing leaves a lot to be desired. There is also quite a bit of on-the-nose symbolism regarding the rebirth of human life, some of which feels out of place. 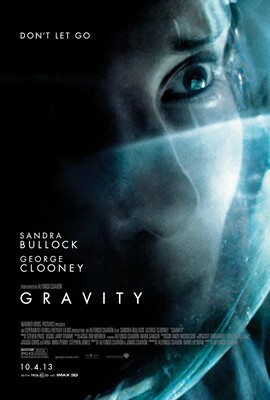 Yet it is a testament to Ms. Sandra Bullock that we are in fact still able to resonate even slightly with her character. The decision to cast Bullock and Clooney — both of whom are comfortable and longtime fan favorites — was a stroke of genius. Going into the film, we already have some sort of connection to the characters simply because of who plays them. Bullock delivers what may be her finest performance yet, and she will certainly get some love during awards season. Clooney is basically playing George Clooney here, but it works for this role. His casual demeanor is the perfect complement for Bullock’s nervousness, and he makes the best of his limited screen time. I truly believe that much of the love for this film comes down to these two actors; if Robert Downey Jr. and Angelina Jolie, both of whom were originally attached to the project, had remained in the film, it could have been an unmitigated disaster. It is especially impressive that even with these script problems, Gravity is a compelling film. The combination of Alfonso Cuarón’s direction and Emmanuel Lubezki’s cinematography is a match made in heaven — just take a look at the film’s remarkable 17-minute opening shot as an example. Their work truly makes it feel as if you are floating in space, and the 3D is entirely organic. It remains to be seen how the film will hold up on DVD/Blu-ray, but as a theatrical experience, few are better. Hey, no problem. Will you be seeing Gravity? Nice review Eric. The visuals of this movie are just amazing and make it so easy for you to get all wrapped up in the story. However, the story itself, especially the character-development, feel a bit weak in the grander scheme of things. Still, totally worth watching on the big screen. Yep, it sounds like we are on the same page with this one. Thanks, Dan. Interested in what you mean by symbolism with rebirth..
Nice review. You’re right about it being deserved to be seen in theaters. I saw it in 3-D and it blew me away. My favorite of the year thus far. Thanks. Yeah, this is one of the few films available that nailed the 3D. It worked perfectly. I saw this movie a few weeks ago in 3D. It was amazing! Great review man. I keep hearing terrific things about this movie; looking forward to checking it out for myself sometime in the future. Without having seen the film, I still have to disagree with you a little regarding it maybe being a disaster with different actors. Outside of fun little roles like Tomb Raider, I’ve never cared for Angelina Jolie, but I have to think Robert Downey Jr could have done a good job. Maybe that’s just because I don’t particularly care for Clooney though. Thanks man. My bad though — I should have clarified about my RDJ/Jolie comment. I don’t have anything against either actor, I like RDJ quite a bit especially, but they just wouldn’t have been the right fit for these roles. Clooney and Bullock both have that “everyman/everywoman” personality to them, whereas RDJ and Jolie are very much Hollywood and kind of come across as larger than life. This film needed much more grounded performers, and Clooney and Bullock happened to be terrific fits for this. Still have to wait! Stupid release dates! Glad you liked it! I honestly really loved the script. it was simple but profound. I guess it’s just a feeling kind of thing, I related to a lot of things in the movie. The incredible visual experience pretty much made up for any shortcomings I found in the film. Great movie. I haven’t read you review incase of spoilers. Does it contain any haha? Also, without giving spoilers. You only gave the film an 8/10. What didn’t you like about it? I tried to keep my review as spoiler-free as possible. As far as the rating, an 8/10 is still great, especially in my rating system. I would actually peg Gravity as my second favorite film of the year so far, though I’m sure that will change after seeing some of the upcoming heavy-hitters. My biggest issues with the film were lack of intriguing character development and some rather on-the-nose symbolism. It’s still a great film, however, and is a must-see on the big screen. Based on the visuals alone, this film should be ranked as an all-time great achievement that will set the bar higher for the art of making movies. I would dare to say that, on a purely visual level, it shares honors with films like 2001, or Metropolis, as a standard bearer that is likely to inspire other film makers to attempt the same or better. Having said that, I do understand the misgivings when it comes to the plot, and I tend to agree with your perception that this film has been way too overblown as if it’s some sort of Earth-shattering event. Like you, I find the backstory behind Ryan contrived, but I forgive these hiccups by just how gorgeous and impressive it all looked. Possibly the most visually astonishing experience of my life in the theater. Hey Niels, thanks so much for all of the thoughtful comments! It sounds like we agree for the most part on Gravity. Even though I “only” gave it an 8, it is still the most satisfying theatrical experience I have had this year. I’m glad I made it my first IMAX 3D experience.